The above Chinese LED lamp is an example of some utter and complete rubbish being exported from China. If the Chinese government or trade bodies had any cop-on, they would ban the export of this sort of trash. It can do nothing but get Chinese industry a bad name. I am a sucker for a bargain and for trying out different things. I bought several lots of 3 watt GU10 lamps on EBay. On average they lasted about 3 weeks before dying, some died after 5 days in use, and a few hang on. Do yourself a big favour and skip this particular rubbish if you are trying for a bargain on EBay. Another purchase that I made turned out very differently. 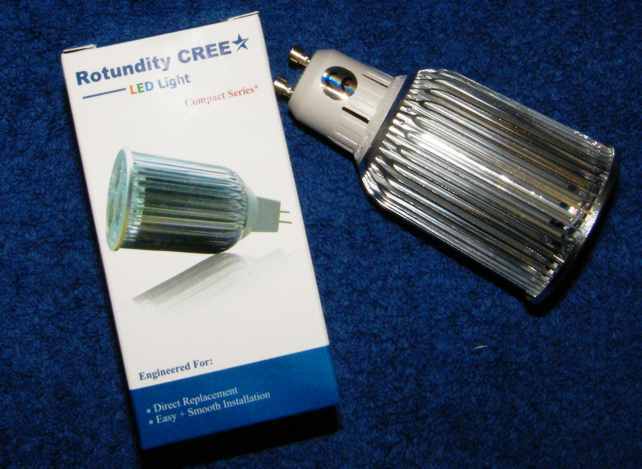 The above GU10 lamp is a 12 Watt 3 emitter lamp. It cost about $10US including postage. There is very good light output and it has been going for 2 months 14 hours a day so far. The only negative comment I have is that the light is a little bit too warm or yellowish. It claims to have Cree emitters, and as you can see the heat sink is fairly massive - that is a good point because what tends to kill LED lamps is heat. If there is a good heat-sink, that means - big in size and plenty of metal, the lamp has a greater possibility of longer life. In the crappy Chinese LED lamp exports, another cause of failure is poor quality driver circuits, some makers use cheap and nasty quality capacitors and other components. The Chinese lesson for today with regard to LED Lamps is "Caveat Emptor"